Not all art deco house have picture rails, but if your one does, you should keep them. The rooms will look much more elegant with them, it’s easier to wallpaper a room with picture rails and yes, you can hang your pictures from them! At least this is one feature that is fairly easy to replace if you have to, although they won’t be original. I know the original wood flooring needs polishing and nurturing, but if you have covered the original flooring with carpet, then you need to get down on your hands and knees and rip that carpet up right now! The flooring may be cold underfoot but buy yourself some fluffy slippers – perhaps some with bunny rabbit ears. I’ll let you buy a rug as well if you must. Who needs an en-suite? They didn’t need them in the 1930s and you don’t need one now! Get a bit of much needed exercise walking those extra steps to the bathroom in the middle of the night. It’ll clock up at least 12 steps on your Fitbit! So what if you wake the rest of the house up – buy them some earplugs! Yes, I know you never go out onto the balcony unless you need to clean the windows but, trust me on this – it will ruin the house if you fill it in. And queuing for the bathroom in the morning is character building! Whatever you do, do NOT, I repeat NOT take out all the fireplaces and brick up the chimneys. A 1930s fireplace should take pride of place in your rooms, but, aesthetics aside, you will have never ending problems with damp if you seal up the fireplaces and chimneys. Here’s an explanation. If you put a roof on an art deco house, what are you left with? Hey, I’m off now to cherish my Art Deco house! I have picture rails to dust! Liked this post? Please pin or share it! Didn’t like it? 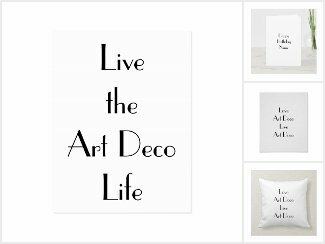 Oh well, you could view my Art Deco collection in my Zazzle shop instead! Reblogged this on Le Grand Art.